Place the finishing jus in a pan over medium-high heat and reduce by half. Once reduced, add the Dijon mustard and cider vinegar. Keep warm. In the meantime, to cook the steaks, season with salt and place them on a hot barbecue or pan, flip the steaks every 15–20 seconds for 2 to 3 minutes, depending on the doneness of the steak. Remove from the barbecue or pan and place on a cooling rack over a tray. Allow to stand for 5 minutes. While the steak is resting, finish the sauce by finely chopping and adding the herbs to the sauce and season with salt and freshly ground black pepper. 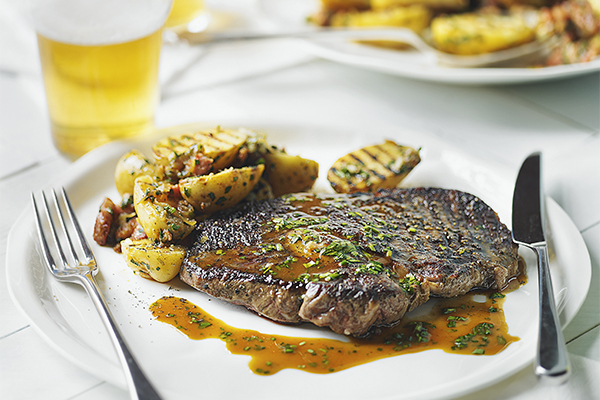 When ready to serve, season the steak with a little more salt and freshly ground black pepper and serve with the parsley sauce spooned on top.